Through their lab work on tree growth and wetland vegetation, students taking Botany 205 with Matthew Opdyke, Ph.D., are learning about the conservation of floodplain wetlands (which play a critical role in flood control) in the Pittsburgh region. "We're studying how the growth rates of trees are affected by climate and the impact that invasive species have on the succession of a floodplain wetland," explained Opdyke, who recently was awarded a grant by Allegheny Land Trust to work with Point Park students on studying the succession of wetland vegetation over time at a property owned by the organization. "What makes this research unique is the long-term commitment to conservation of a floodplain wetland in the Pittsburgh region and the collaboration between our University and Allegheny Land Trust," Opdyke added. Since 2007, Opdyke has received more than $3,000 in grants to study wetland succession and dendrochronology, the scientific method of dating tree rings, on Allegheny Land Trust properties. Emilie Rzotkiewicz, stewardship director for Allegheny Land Trust, recently gave a presentation to the botany students on the Wingfield Pines Conservation Area. Also this semester, the students conducted lab work at Frick Park near the Nine Mile Run Watershed. "It was awesome being able to go outside of the classroom. You definitely learn more when you can identify trees and plants first-hand instead of just looking at them in a book," said Lindsay Schirnhofer, a senior biology major concentrating in organismal science. Olivia Baker and Madeleine Adams, forensic science juniors and Matthew Love, a senior biology major with a concentration in environmental science, also enjoy the hands-on lab work - and the small class sizes at Point Park. "I think you retain more information by actually doing the work rather than just hearing about it through a lecture," remarked Baker. "The classes are a good size. That's why I chose Point Park," added Adams. "Botany has been my favorite class. Through the lab work, you can really see first-hand what you are studying," said Love. Students in the natural sciences majors at Point Park have completed a wide variety of independent studies and internships, networked with environmental professionals through class field trips and attended and presented at national conferences with faculty. 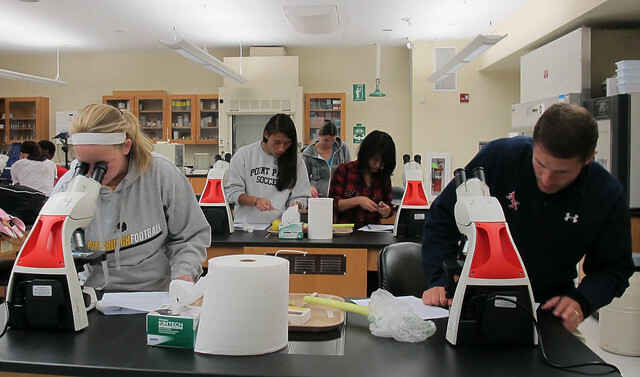 "The smaller class sizes allow for more interaction between students and faculty," said Angela Robinet, a senior biology major concentrating in organismal science. "The professors at Point Park have been incredibly helpful." Recent Point Park biology alumni Bryan Dolney and Ingrid Reiland completed independent studies in ecology which ultimately led to them landing positions with the Pittsburgh Parks Conservancy and Civil and Environmental Consultants, Inc., respectively. "Having strong research skills is a major asset to obtaining a career in environmental science," said Opdyke.